Process: Prep the slab to ensure it is clean and porous. Use NewLook EcoAcid to exfoliate and clean. Rinse and remove any remaining residue. 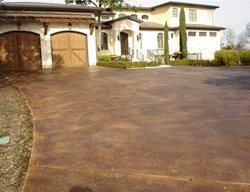 Once the surface is dry, apply SmartColor (Beach House) base color onto the surface using an HVLP sprayer. Allow SmartColor to dry (usually less than 1 hour). Mist the Translucent Color Enhancer (Dark Brown) over SmartColor using an HVLP sprayer. Once dry, apply thin coats of SmartSeal AU-25 using a low nap roller. Process: Prepare concrete using EcoAcid and power washer. Installed two coats of ORIGINAL Solid Color Stain (Light Wheat in main area and Summer Sand on bands). Allowed stain to dry at least an hour. Installed a coat of Translucent Color Enhancer (Summer Sand) in main area. Sealed with a water-based sealer. 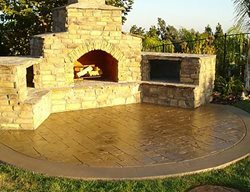 Exterior staining complements brick, stone and concrete colors and textures, and performs well in all outdoor applications. 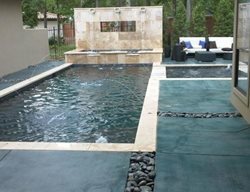 This pool surround features Kemiko ‘Cola’ stain, a deep earth-tone that balances the lighter coping and stonework. 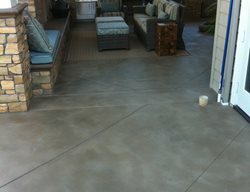 In Redlands, Calif., this pool deck, patio and sidewalk had originally been painted and needed three coats of thick paint removed from the surface. Using Franmar Soy Gel, Staintec owner, Glen Roman, put down the gel, covered the area in plastic overnight, and then hot pressure washed the paint off the surface. 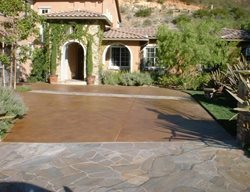 Using a self-sealing, water-based stain, he colored the sidewalk, pool, and patio in Newlook’s Summer Sand color. 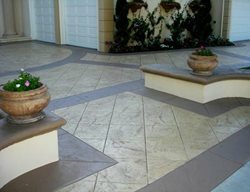 He antiqued the patio and sidewalk with a darker color of maple for contrast. 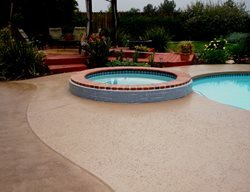 Concrete Coatings Super Seal 20WB was used on the patio and sidewalk to protect the antiquing which could be affected by the pool water. The project was 1,100 square feet. Using Newlook products gave the project a great look, and made it cost-effective. This striking pool deck was fashioned using Spraycrete’s trowelled on texture. The brick border was also added with this process. The colors used on the deck were a custom mix of adobe, gold, and terra cota which was hand stained to match the house. Kemiko Cola stained pool deck. 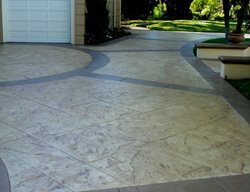 The pool installers did not offer the homeowner the option of decorative concrete for their deck. 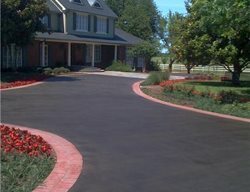 Creative Concrete Solutions was hired to do a straight stain. Stamping the deck after it had been poured would have been too costly, but the homeowner still wanted to enhance the deck. 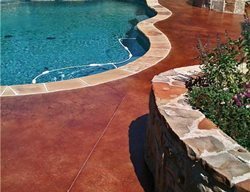 Staining it provided a cost-effective way to add color and beauty to the pool deck. 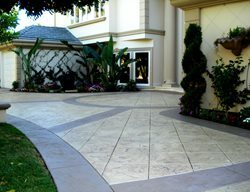 This residential patio was created for a client with a very clear design vision. 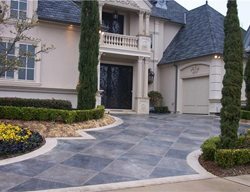 However, they didn't know much about decorative concrete, so they had to be educated on the possibilities. 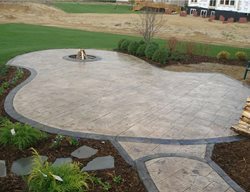 They were quickly sold on decorative concrete and came up with this leaf design. 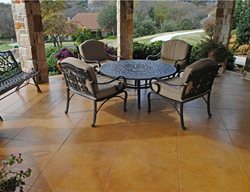 The base color of the patio was a dry shake color hardener in Adobe Buff, from Brickform. The texture was created using Brickform's Sierra Seamless Texture Skins. The leaf pattern was saw cut by hand and stained with Kemiko's Golden Wheat, Vintage Umber and Black. 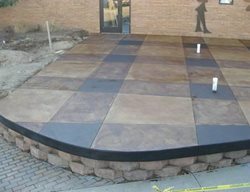 The saw cuts were grouted with a dark mocha chocolate to complete the look.